Suspension Diagnostic, Repair and Replacement Service; Strut Mounts, Struts, Shocks, Coil Springs, Leaf Springs, Steering Knuckles, Upper Control Arms, Lower Control Arms, Ball Joints, Sway Bar and Bushings Replacement in MA, RI, Attleboro, Mansfield, North Attleboro, Plainville, Cumberland, Pawtucket. 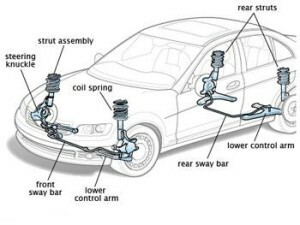 The suspension system is a combination of springs, shock absorbers and linkages that connects a car to the wheels, and prevents a car from shaking to pieces. The primary purpose of a suspension system is maximizing the friction between the tires and the road surface for safety in handling and braking. The Second is passenger comfort from road noise and bumps. Springs and shocks work together to absorb the energy of the vertically accelerated wheel, allowing the frame and body to ride undisturbed while the wheels follow bumps in the road. Springs act like a cushion, allowing the wheel to maintain contact with road surface when traveling over a bump. 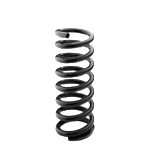 There are three types of spring; coil springs, torsion bars and leaf springs. Shock absorbers are dampers, reducing the bounce of the springs while keeping the wheels planted on the road. The larger the force, the more resistance there is to that movement by forcing gas or oil through a constriction valve. 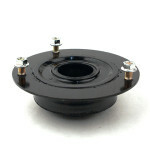 The strut mount is the mounting point that attaches the suspension strut to the vehicle chassis. The rubber in the middle of the strut mount acts as a cushion absorbing road noise and vibrations as the vehicle moves and goes over bumps. Many front strut mounts also contain a bearing or bearing plate that serves as the steering pivot that help with steering smoothness and response. 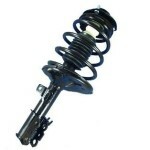 The strut assembly is a shock absorber and a coil spring assembled as one coil working together to give the car its height, optimal damping, good handling and braking, and a comfortable ride all at the same time. While the coil spring compresses and stretches to keep the car level and ensure that all four tires have contact with the road, the shock stops a car from bouncing up and down by absorbing road noise, bumps, and vibrations. A shock is a hydraulic device designed to absorb and damp shock impulses to keep a car from bouncing. It does this by converting kinetic energy of the shock into heat which is then dissipated. Shocks consist of two nested cylindrical tubes, an inner tube and an outer tube with a compression valve at the bottom that moves hydraulic fluid between the two tubes converting the shock energy into heat. The shock is connected to an upper control arm giving better handling and is not connected directly to the suspension system like a strut is. a coil spring is a helical spring made of metal wire or a metal band that is wrapped around the strut assembly to support the weight of a car and allows it to remain stable by keeping all four wheels planted on the ground. Coil springs store energy and release it when needed by expanding when you hit dips on the road, they also absorb shock by compressing when you encounter bumps. 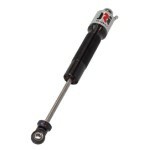 Shock springs also stabilize steering by compressing and expanding as you cut into hard corners. Leaf springs acts the same as a coil springs, the interleaf compress to absorb impact when tires roll over rough terrain. 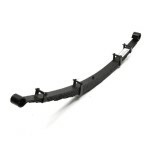 A leaf spring is a semi-elliptical spring stell taking the form of a slender arc. The spring is made from several leaves stacked on top of each other in several layers, with progressively shorter leaves. Leaf springs are mostly found on trucks, heavy duty vehicles, and vehicles that predate 1985. it is one of the oldest forms of springing, dating back to medieval times. A steering knuckle is part of the suspension system that holds the front wheel on the car and lets you change direction when steering. The steering knuckle is the place where where the wheel meets the suspension meets the steering system. The wheel mounts to the outside, via a wheel hub or a spindle, and attaches to the suspension system via the upper and lower control arms, tie rods connect inboard that allow the knuckle to pivot to steer the car. A control arm connects the suspension of the car to the frame. 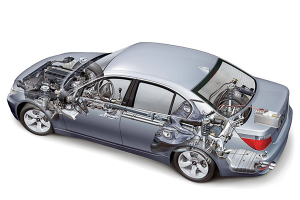 Control arms are connected to the frame of a car through two bushings, one at each end, and to the suspension through a ball joint. They allow car tires to smoothly go up and down by controlling the motion of the wheels so they’re in line with the car’s body. When a car hits a bump, the control arm compresses the weight, keeping the bottom of the tire in its place. 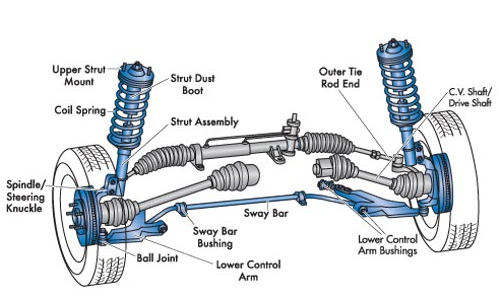 Cars with struts have two lower control arms while cars with shocks have four control arms; upper control arms and lower control arms. 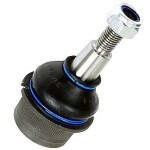 Ball joints are a spherical bearings that connect the steering knuckles to the control arms. A ball joint is a steel bearing stud that is similar to a flexible ball and a socket that allows the suspension to move, they work the same way the ball and socket of the human hip joint. A rubber boot protects the ball joint from dirt and retains lubricants for a smooth movements. A sway bar or stabilizer bar helps reduce a vehicle rolling over during cornering by connecting the suspensions on opposite sides. It attaches to the underside of a chassis and the lower control arms via sway bar links. When entering a turn, a sway bar makes the side of the suspension that has less weigh compress and decompresses the suspension that is bearing the weight. The turn creates a twisting force on the sway bar which then creates a lifting force on the outside control arm. The force counters the weight transfer and the result is a flatter handling experience. 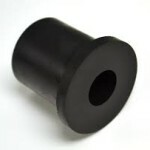 A bushing or is a small rubber suspension components that is used for flexible anti-vibration mounting. Bushings are used as cushioning between metal parts at the same time allowing some movement in order to reduce friction and isolate vibration. There are several bushings throughout a cars’ suspension and frame, the most common bushings are the control arm bushings and the sway bar bushings also known as say bar links. 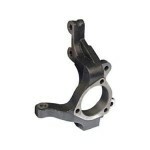 These bushings come in many different forms and designs including annular cylinders and internal crush tubes. Whether you’re looking to repair or replace a part of a suspension system, Advanced Auto Repair offers quality suspension repair in North Attleborough MA. Full steering and suspension system repair including Upper Strut Mounts, Strut Assembly, Shocks, Coil Springs, Leaf Springs, Steering Knuckles, Control Arms, Upper Control Arms, Lower Control Arms, Control Arm Bushings, Ball Joints, Sway Bar, Sway Bar Bushings repair and replacement. Our professional technicians can diagnose your cars suspension noise, clunks, squeaks and issue, and perform repairs, quickly and efficiently for a nice smooth ride at competitive affordable prices.